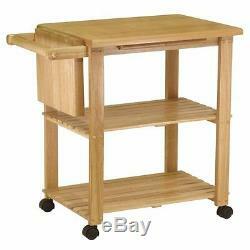 Winsome Utility Butcher Block Kitchen Cart in Natural Finish. Receive all the help you need in the kitchen with the Winsome Utility Kitchen Cart with 2 Shelves. The cutting board, knife holders and shelves make food preparation a breeze. So make a delicious, gourmet meal with ease with the Winsome Kitchen Cart. Holder for cloth or dishtowel. Overall dimensions: 31.63" H x 33.33" W x 20.13 D. Shelf dimensions: 26.97" W x 15.94" D. Middle Shelf clearance: 11.48. Bottom shelf clearance: 12.71. The item "Winsome Utility Butcher Block Kitchen Cart Wood in Natural Finish" is in sale since Monday, December 28, 2015. This item is in the category "Home & Garden\Kitchen, Dining & Bar\Kitchen Islands/Kitchen Carts". The seller is "homesquare" and is located in Sterling, Virginia.